Created to provide modern nag-free HTTPS connections for an HTTP proxy. If you'd like to learn more about this step, visit this excellent tutorial. If you see /bin/csh, then change shell by simply typing bash. Changing shell to Bash—or any other that's not C—is only necessary to allow Brew installation using Ruby. Step 2: install Homebrew from http://brew.sh or visit this GitHub page. If you encountered an issue during the installation, install the full Xcode package and try again. Above, it is not recommended to run chown command with option -R for security reasons. However, if you run into tons of problems–such as being not able to upgrade packages installed via Homebrew–then sadly, in very last resort, you use the option -R. It is worth mentioning that ClamXav, for example, does not appreciate–for very legitimate reasons–the use of this recursive mode from the /usr/local/ folder. Note that the first command above—beginning with sudo—has to be run after every permission repair. If not, Homebrew will run into trouble during manual package upgrade. Step 4: obtain ProxHTTPSProxyMII Python scripts from the “ProxHTTPSProxyMII: Development” thread. Step 8: open config.ini file—inside ProxHTTPSProxyMII folder. Locate ProxAddr and set port to 8118, thus replacing 8080. Note 2: use ProxHTTPSProxyMII's config file to set exceptions under [SSL Pass-Thru]; make a backup of it for later upgrade. Note 4: for more info on ProxHTTPSProxyMII, visit http://www.proxfilter.net/proxhttpsproxy/index.html, ProxHTTPSProxyMII thread and GitHub page. Note 5: activating temporary root access on a regular user account. Log on to your Administrator account. Note 6: if you intend to use Homebrew's upgrade command, it might be worth to check this article first. This one is interesting as well! System Integrity Protection in OS X El Capitan could cause some issues. 1. Delete the folder in which ProxHTTPSProxyMII has been placed (am I correct to assume that all the files for the program are in that one folder and that no config is placed elsewhere?). Any other steps I've missed? 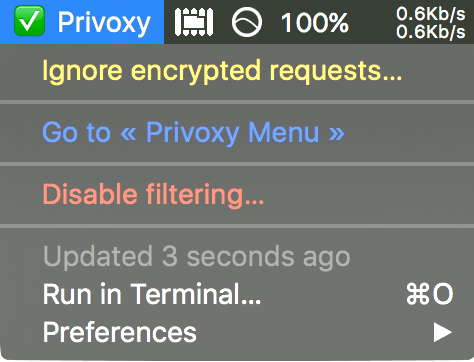 thanks for your interest in enhancing the power of Privoxy with the fabulous ProxHTTPSProxyMII! Below, the steps I would carry out in order to clean up everything. Step 1: Uninstalling Homebrew—with all installed packages. Then, visit Homebrew's FAQ and look for Section How do I uninstall Homebrew? ; running the ruby command in Terminal is enough. This step will delete any trace of Python version as well as the pip command. Step 4: Finally, you can just drag the folder ProxHTTPSProxyMII—in which you were presumably running JJoe's Python script—to the trash can. (Oct. 12, 2015 10:22 PM)Faxopita Wrote: Finally, you can just drag the folder ProxHTTPSProxyMII—in which you were presumably running JJoe's Python script—to the trash can. Whoa! whenever is the author. My apologies to whenever. Anyway, you're both the stars of the forum. For those who have not managed to properly configure ProxHTTPSProxyMII on OS X yet—and were too shy to let me know—my most sincere apologies. I've forgotten to mention Step 7… Please, try again. Don't get discouraged! Tested successfully on Yosemite and El Capitan. Retrieve the attached archive to this post. Copy ProxHTTPSProxy.sh script to your favourite script folder. Modify the script so it can locate both your own Python binary and ProxHTTPSProxy folders; currently set are my own ones. To verify the service is loaded: launchctl list | grep "prxbx"
In the .PLIST file, make the necessary change as per [INSERT_ABSOLUTE_PATH]. Copy Privoxy2GoTTY.sh to your script folder. Currently set to listen on Port 8082; amend if necessary. In all scripts, replace "Thunderbolt Ethernet" by Wi-Fi if necessary. Other alternative: complete with configuring other device ports at the same time. I did not find any better solution than activating Privoxy logging. If issues in detecting Privoxy status, unable debug modes 512, 4096, 8192 or try any one of those. Note: you might need to claim the ownership of the log file if you choose to add the cron job as a regular user. Make sure Privoxy has write access to the log file too! Otherwise, it will crash. Both located inside your BitBar folder. If you're not in the habit of clearing Privoxy's logfile once in a while—you may want to keep it for later examination—I suggest you “rotate” it daily in order to reduce CPU usage every time the command grep is called—every x seconds. Highly recommended since using such a command-line utility cyclically on a logfile of 100's of MB (past a million entries) can have a serious impact on your CPU during a few seconds. Not good if you're on battery then! To list your cron jobs: `contrab -l`. I have revised the tuto. Make ProxHTTPSProxy Start Automatically at Session Login. It is not clear 3 and 4 points. Allow Privoxy to Block All Requests if VPN Turned Off! If you are interested, then this post is for you, but first: retrieve the attached archive to this post and back up immediately your `user.action` file! Amend your own `user.action` file. The script uses GNU sed; I got it with Homebrew. Perhaps you'd like to use the version installed with the base system. If so, you might find the need to tweak the corresponding syntax in the script. Allocate your own paths to `pri_path` and `sed_path`. Copy AllVPN.sh script to your script folder. Copy privoxy.vpn.bridge.plist to ~/Library/LaunchAgents; it's the one attached to your Home directory. Edit the above .PLIST file and replace [INSERT_ABSOLUTE_PATH] by the path—in absolute terms—leading to the script `AllVPN.sh`. To verify the service is loaded: launchctl list | grep "bridge"